● With special wired microphone make voice more clearly. ● Bluetooth automatically connect after restarting. 2. Pairing your phone and FM transmitter by Bluetooth. 1 * Remote Control Unit. ✔【New Smart phone holder】: Stand with adjustable smart phone, GPS and MP3 Player holder. DSP technology, full duplex, noise and echo suppression. Rotating head allows angle adjustments, horizontal or vertical device orientation. ✔【Hands free】: Supports smart phone hands free talking. Voice prompt function. 3.5mm Aux-in plug with micro phone. ✔【Excellent stereo sound quality】: Bluetooth sound processing A2DP, High-performance with Echo cancellation and noise suppression (CVC) technology which can offer your clear talking and wonderful music. ✔【Car charger with standard】: USB charging port, output 5V/1A. Broadcast your music while charging phone or iPod MP3 Player. 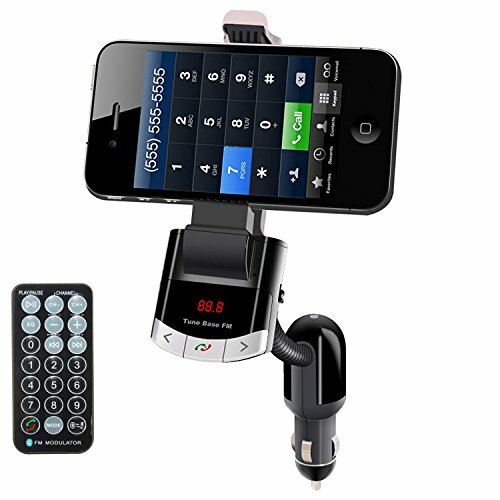 ✔【Easy to use】: Pairing your phone and FM transmitter by bluetooth, insert device in the socket, switch to FM radio mode, make sure FM transmitter frequency the same as car's FM, then you can enjoy your music what you want! If you have any questions about this product by etopbest, contact us by completing and submitting the form below. If you are looking for a specif part number, please include it with your message.